It feels like the first thing that has to be written about this website is a disclaimer. YOU, whoever you are, are likely to be offended by this website. This purpose of this website is to act as a platform for women who do not subscribe to feminists ideologies to express their opinions. As most of you already know in the west more than 80% of women when polled say that they are “not feminists”. Most of that 80% would not be willing to describe themselves as anti-feminists, but rather as women who do not agree with important aspects of feminism. Non-feminists women are such a large group, existing throughout so many sections of our society that a space for them or by them has never really been possible. Within this website you will find anti-feminists women, like Claire Khaw, who would like to see laws similar to sharia laws become a part of legislature in western countries, as well as ultra liberal writers who despite their aversion to war would rather see every man and woman sent to war before the “secular koranic” laws Khaw often writes about are ever actually considered. You see the reason no one is aware that so many women are anti-feminists is largely because anti-feminists women are very divided. We are liberal, we are conservative and we are everything in-between. Some of us are anti feminists because of the negative effects of feminism on men, some of us worry more about the negative effects it has on women, while some of us focus on the negative effects of feminism on families or society as a whole. Our list of differences is endless, and till now these differences has completely divided us. Divide and conquer; anti-feminist women do not have a strong voice because our anti-feminism is largely drowned out us by bickering among ourselves about our differences. Which brings us back to offence. You are going to be offended by the contents of this website simply because the views expressed here are pulled from a wider cross-section of society than most of us are exposed to in today’s “i-live-in-my-own-bubble” culture. The views in the articles posted here do not represent all women against feminism, they simply represent the thoughts and opinions of the individual women who wrote them. 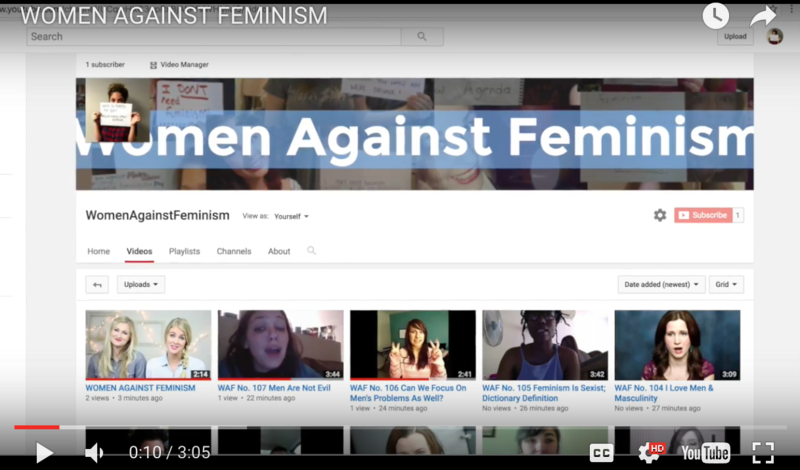 The aim of this website is to give all women who oppose feminism a platform to express their individual views on feminism. We do as much as we can to verify that all articles presented here are written by women, even in the cases where the women prefer to remain anonymous, and we hope that somewhere in between all the expected offence you will find joy and thought provoking ideas within this website!